This cute little Scottee has been lovingly created by internationally renowned collage artist Peter Clark. Peter’s approach is to create wonderful three dimensional images using found objects, such as letters and stamps. 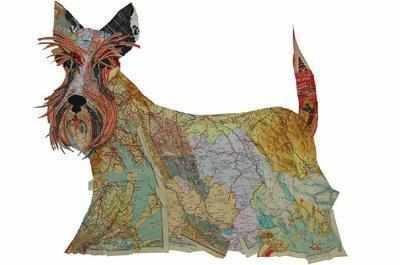 As we look more closely at this Scottee, we see he is predominantly made from maps, cleverly using the pattern to give form and tone. The collage is reproduced as a screen print on this tea towel. Scottee is full of wit and character and will be enjoyed by anyone who loves dogs, art, or who wants some fun and humour in the kitchen.